Last week a couple videos of a new 7.8-inch 300 ppi ereader called the Icarus Illumina XL HD started showing up on YouTube. A few days later it turned up on Indiegogo for pre-order. The early bird packages are already sold out, but they’re still taking pre-orders for $199 USD plus shipping. Icarus is based in the Netherlands but they ship worldwide. 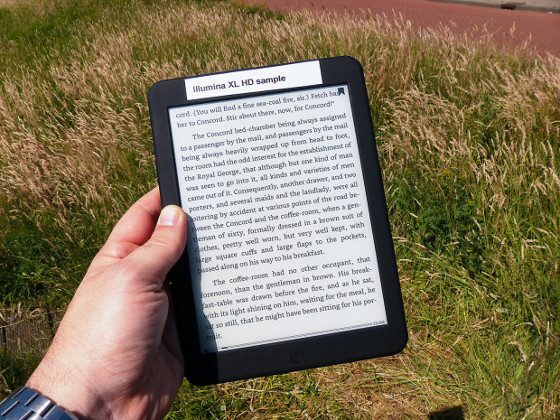 The Illumina XL HD is the first ereader besides the Kobo Aura One to feature a 7.8-inch 300 ppi E Ink screen. They are priced about the same, with the Aura One being $229 with free shipping. The Icarus ereader runs Android 4.2 so it’s a lot different than the Kobo. Plus it supports audio and it has a faster 1.8GHz processor and double the RAM and storage space. See the post from last week about the Icarus Illumina XL HD for a full list of specs. It’s good to see more medium-sized ereaders hitting the market. The 7.8-inch screen is my favorite size for reading. 6-inch ereaders are nice for portability, but I like 7.8-inch screens more for reading at home. Hopefully this is the start of a new trend; we’ve already got plenty of 6-inch ereaders to choose from. Its a shame they don’t opensource the firmware, let the community have their way with the firmware and you would have a rock stable ereader tuned OS that they could benefit from. For me it’s crucial that an e-reader has the Oxford English dictionary in it. Which dictionary does this one have? Thank you. Hard telling… It says it has a dictionary in the description but it doesn’t specify which one. Where do I find information about shipping costs? I don’t know. I assume it will say during the payment process. why is it sooooo slow to do the simplest of tasks….? @bdubs: Can you provide with some info about this e-reader? I’m thinking of buying it but since it’s a brand new one no review is available online. Thanx!! Bumped up CPU and ram specs are entirely unnecessary for book readers! They only consume more battery.